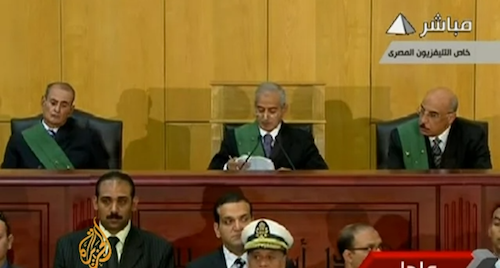 Judge Ahmed Refaat (center) reads the verdicts in Egypt's 'Trial of the Century.' Photo: Youtube user AlJazeeraEnglish. Judge Ahmed Refaat is old and wise. As a figure of authority he has been respected and admired in our country for decades. In his verdicts the public has seen truth and the defeat of injustice. Here they are on June 3, asking him to convict those who shed their martyrs’ blood. They want him to once again erect a just system in the country and establish the guidelines for a new era in Egypt. The judge that is looking into the revolution’s cases is approaching his 70s. Soon he can retire or have a high post in the ministry of justice. However he is still lively at his perch on the bench. With this case Judge Refaat has finally moved from the isolation of the private courtroom to the public sphere: He has become a prominent face in the media and a household name. Indeed, on June 3 as he sits erect at the bench, he is observed by the whole world. Millions of viewers are glued to their seats, their eyes fixed on his face. Millions of ears are directed towards his voice, awaiting his decision. The fate of bodies and souls depend on his words. And the minds of thousands wonder, “Where did this judge come from?” “How did he reach such a high post?” “God only knows who appointed him, and why?” Then this wise judge gives his strange verdict: First condemning, and then approving, the very same actions, then denying evidence, and finally declaring innocent those whom he is aware are guilty. But the judge is a part of the whole; he is a cog in a machine that has been active for years. So it is not a huge surprise that his loyalty is to the machine, to the regime. With this verdict he has turned a blind eye to justice and the people in whose very name he judges. This wise judge’s head is filled with thoughts of returning favors to those who appointed him or bestowed on him many awards. He has warm feelings toward the country’s powerful elite, whom he trusts in words and actions. He has dreams of a pleasant and comfortable retirement (or a prominent position in the near future), a fruitful future for his children and grandchildren, and the continuation of a legacy that came to him without much effort. He will go down in history as the most famous Egyptian judge and maybe among the wisest judges in the world. He has laid down the rules of justice and fulfilled what the regime required of him: He has blocked his ears and shut his eyes to all that has happened. This wise judge has returned pride and respect to the regime and defeated its enemies; therefore victory for him will be eternal. No revolution, no nonsense, return to your homes people of Egypt!